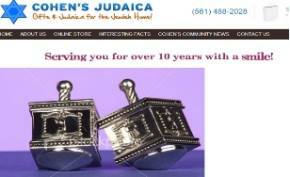 Bitochon designed this Ecommerce website for a Judaica business in Brooklyn, NY. Customers can browse, shop and view ketubot, tallitot, mezzuzot, holiday necessities and Jewish gifts for every occasion. The Ecommerce store enables the merchant to upload photos and information about its products, accept payment for orders via credit card and ship orders. The easy-to-use administration interface allows the merchant to change site’s content.